When making the most of a space, seemingly small details can make a huge difference. Lots of decisions and details go into making a room come together. One of the more simple details that has a huge payoff is in the installation of curtains. My clients ask me all the time how high they should install curtains in the nursery. They have seen images on Instagram and pinned photos on Pinterest with really tall curtains hung just under the ceiling line and wonder if that is the “correct” way. YES, yes it is! Let’s take a look at a few amazing nursery photos below and let me convince you. Amongst everything that is amazing about this design above, what my eye immediately goes to is the height of that curtain rod. 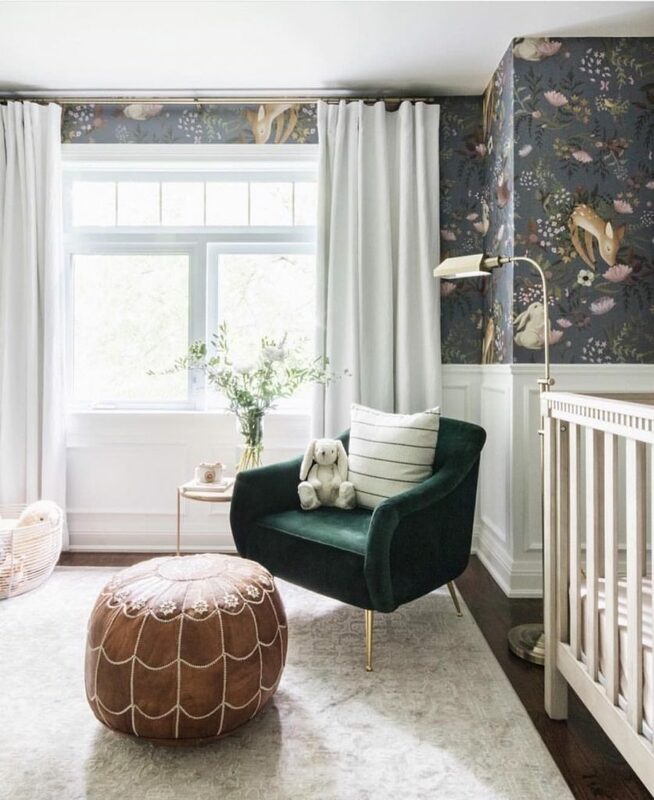 This simple design decision instantly elevates the look of the window, feel of the room, and creates an elegant backdrop for this gorgeous nursery. The ceilings are not high in this space, probably your standard 8 feet, but with the curtains installed high up, the room feels much larger and grander. 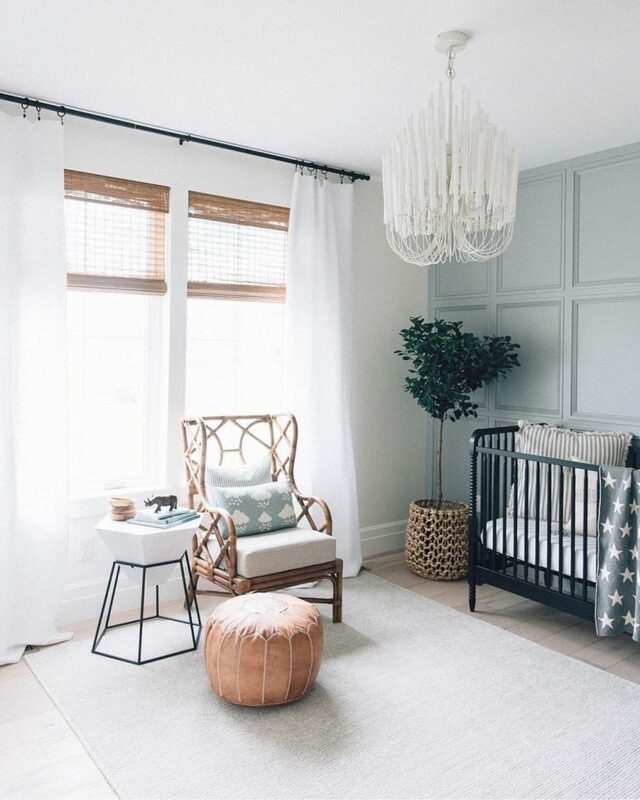 This peaceful nursery is such a great example of how to layer window shades with a high-hung curtains. If you have 8-foot ceilings, hanging your curtains right below the ceiling line will especially have a dramatic effect. Letting the rod extend past the actual window frames will also give a visual effect of a larger window and at the same time not block any precious light during the day. 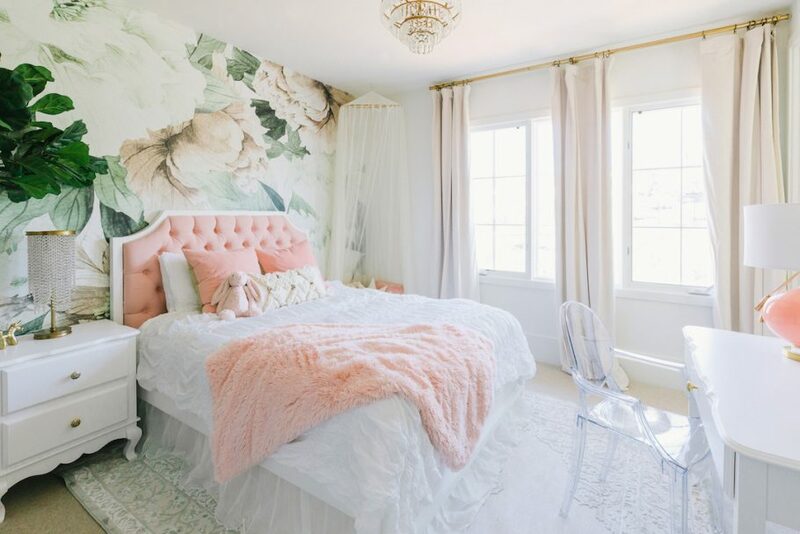 When I designed this girl’s floral bedroom last year, the tall curtains were a given. They play a big part in making this room feel elegant and luxurious and the way they frame the window wall makes them look like they just keep going. Taking full advantage of your space and the height of your walls will make your room feel larger and grander. So, if you’ve been questioning how to install curtains in your nursery, now you know. Hang them high and wide for a much more sophisticated look!